This week I wanted to highlight a fantastic food that can be utilized in many different capacities – guacamole! A while back (like 3 years ago) I wrote a piece about my favorite condiments, which of course guacamole was on the list and that certainly has not changed. 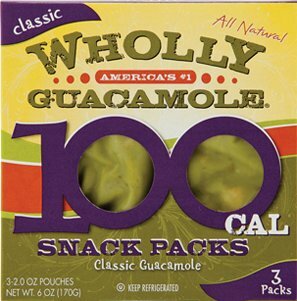 In particular I want to highlight the Wholly Guacamole 100 Calorie Packs. While I don’t normally endorse 100 Calorie Pack foods because they are usually junk, in this case you get a pre-set portion of a healthy item. In addition since guacamole tends to good bad quickly when exposed to air, utilizing these small packages limits waste. One great way to use guacamole is in place of meals where you, might use mayonnaise. It provides that same creamy texture, but is less calorie dense, provides a serving of produce (avocados are one of those in between types, where they are treated as both fruit and vegetable) and provides a good source of fiber, potassium, lutein and more. In terms of consumption I like to use half of the package on my sandwich or wrap, and use the other half with a serving of baby carrots, cucumber slices or bell pepper slices. You are using produce as a condiment for produce! Now that is a winning combination. In the end guacamole can be used in a lot of different ways, provides a creamy texture with a mild flavor, is made up of mostly avocados and provides more than 25 essential nutrients.